Why doesn't Batch Analysis show URL Rating (UR) and social stats? Find out how to get Batch Analysis to show UR and social stats. Is it possible for Ahrefs' Batch Analysis tool to show either UR or data from social media? 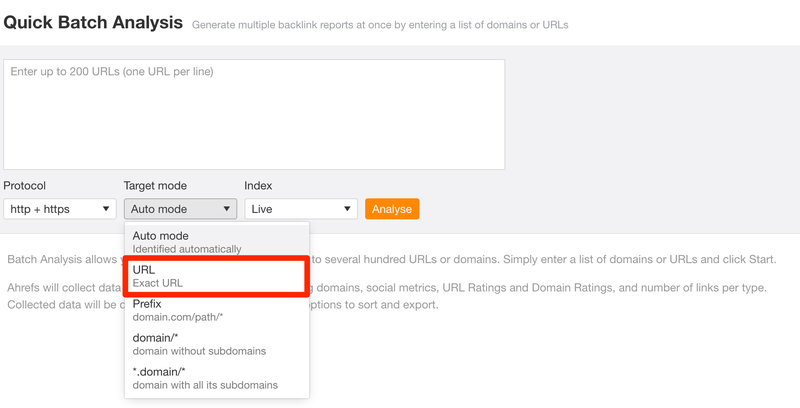 To get social data and URL Rating (URL), you'll have to analyze the domain/URL in "URL mode" (or "Exact URL"). How many domains/URLs can I analyse with the Batch Analysis tool? What is Ahrefs URL Rating and how is it calculated?